Microsoft Student Community NTNU, where I'm a member, will arrange a NUNit and NDoc Workshop soon. The exact date hasn't been decided yet, but it will probably be next week. I will be leading the workshop and we are going to focus on how to write good unit tests with NUnit, and actually write them. We are also going to take a look at code documentation with NDoc. So look for the date announcement here and on http://www.msstudent.no. Hope to see you there! By the way, I became a Microsoft Certified Database Administrator (MCDBA) after taking exam 70-290 today! Update: It looks like week 18 (1/5 - 7/5) is too busy for us. We will try to hold it next week (week 19). All kinds of IRC bots has existed for quite some time, everything from quiz bots to channel admin bots. You can't connect to IRC without seeing them. In the later years MSN Messenger has become increasingly popular, and now bots are beginning to appear here too. Below is a screen shot of a conversation with it. I went to "The Gathering" this Easter, as I have done the last 5 years. 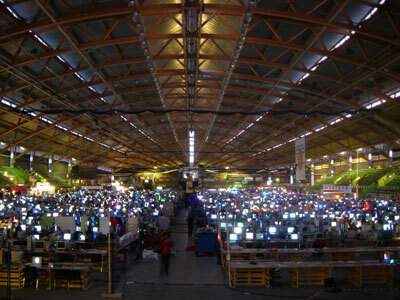 "The Gathering" is one of the world's largest computer parties with around 5000 attendees, held in the Olympic arena "The Vikingship" in Hamar, Norway every Easter. There are a lot of things going on there these 5 days from Wednesday to Sunday; scene shows, lectures, gaming competitions and other cool things. This year things seem to have gone quite smoothly for the organizers. There were almost no queue to get in when we got there, and the network worked perfectly. In fact the Tech:Net-crew stated that they were bored and that we weren't even close to max out the internal network capacity. The internet line, though, was easily maxed out, with it's 1,5 GBit. By the way, those of you who thinks that all big Microsoft projects are written i C/C++, check out Jonas' line count trivia. We are doing a development project in C# in school now, and in we are (of course ) using a build server with CruiseControl .NET for continuous integration of the project. While we (the developers) and the build server are located on the university network, the test server is located in a local company's intranet. To make the build process really nifty, I decided to make it deploy the finished build right onto the test server. To do that I had to set up a VPN connection from the build server and into the company network. And this is were the fun starts. So I went straight for it to test it - created a new VPN connection, typed in the user name and password and clicked connect. Without clearing out the "Use default gateway on remote network" checkbox. Through remote desktop. Guess what happened? Yup, the server disappeared from the internet and my RDP-connection froze. Did I mention that the server is located in a locked room, to which I don't have the key? Then the fun started - trying to get hold of the key. After about an hour I got hold of the key and disconnected the VPN-connection. Please clear this box before connecting to VPN from a remote server.